Rare waterfront find in Jax! If you yearn for the country-like feel but want to still be centrally located to downtown, beaches, retail and thoroughfares then come take a look! Hidden brick gem situated on over an acre on Mill Creek which leads to Arlington River! You can get almost a dozen cars in the driveway! 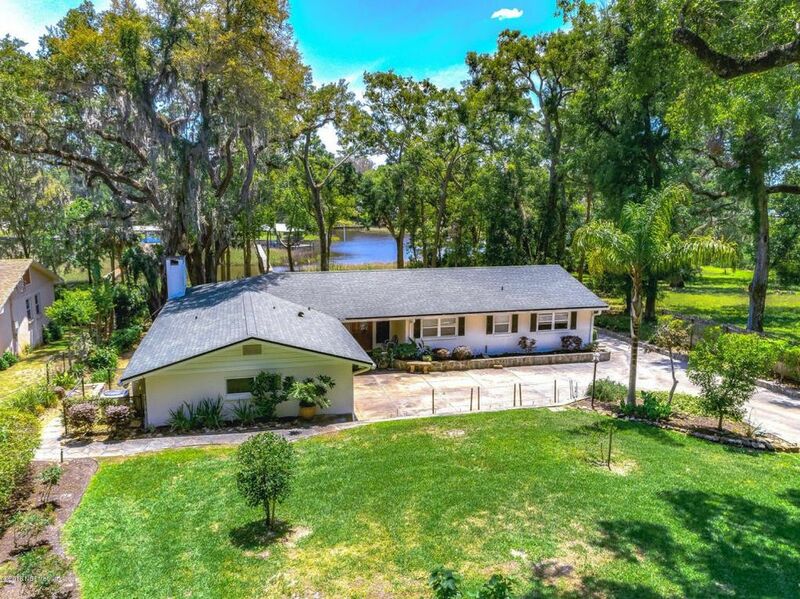 Huge screened lanai overlooking the large grassy backyard w/mature trees, wildlife & water views. So peaceful & serene...take a load off and pull up a chair! Inside there is lots of tile & wood floors along w/indoor laundry, updated kitchen w/large food prep area, granite counters, dining area offers plenty of room for large table & buffet and gathering room has brick fireplace - lots of windows overlooking the view of the water. Master bedroom has en suite bath w/sep shower and tub w/vanity w/his and her sinks w/access door to screened lanai. There are built-ins the closets for lots of storage. Hall bathroom has double sinks w/tub shower combo. One of the secondary bedrooms has Murphy Bed (needs mattress) but great for guests when visiting. The covered lift can hold up to 28' boat. Roof - 2014. Previous owner redid home down to the studs in 2003. The private road has 5 homes total and most have lived there over the last for 2 to 4 decades. Dock sold as-is, aged. Per Seller re: water/dock/left - The tide will recede to the front of the dock, but there it enough depth at the rear of the dock to get out with a boat year around. Dock motor lift worked fine the last time I tried it (approx 4 months ago) but have not tried since. The dock needs wood work some planks need replacing, dock lights do not work, one light broke off. Cutoff valve for the water needs replacing. Front yard has sprinkler system. Two septic systems. You may check the listing history for additional info and interior photos if you like. Directions: South on Arlington Rd from Arlington Expy, immediate right onto Larkin Rd, t/l on Mickler Rd., will run into Strawberry Ln. (stay left - dirt road).